Synopsis (from Goodreads): Emily Starr has never known what it is to be unloved. But when her father dies, she is left in the care of her mother's family. Emily is a stranger to the proud Murrays, none of whom think they can cope with such a heartbroken, headstrong girl. 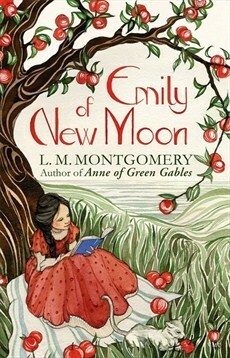 They decide to draw lots for her, and Emily is sent to live at New Moon with stern Aunt Elizabeth, the head of the clan. Kind Aunt Laura and friendly, eccentric Cousin Jimmy also live at New Moon, though, so she is not without hope. Emily is enchanted by New Moon, but cannot believe she will ever belong there. With her lively imagination and dreams of being a famous writer, she seems to have a talent for scandalising her family. Before long, though, she has made firm friends: Ilse, a tomboy with a blazing temper, Teddy, an aspiring artist, and Perry, the ambitious houseboy. She brings so much life to New Moon, perhaps one day even Aunt Elizabeth will consider herself lucky to have 'won' Emily. I think the main problem that I had with this book was that it wasn't Anne of Green Gables (which is one of my favourite books ever). I didn't exactly expect it to be, of course, but although the basic premise of the book is the same (i.e. orphan girl being reluctantly adopted by older people who don't really understand her), it has quite a different ... tone? ... about it. While I sympathised with Emily a lot when she was being misunderstood or treated unfairly, I didn't find her nearly so likeable as Anne. Also I felt that the level of conflict and misunderstandings between characters in this book meant that I didn't enjoy it so much - although it was probably realistic given the situation the characters were in it wasn't always comfortable to read about. Having said all this, however, I did enjoy this book - it was by L.M. Montgomery, after all. It was definitely a good story and there were some beautiful descriptions in it. I'm glad I finally read it, anyway (after having been meaning to for a long time), but I don't think I'll be re-reading it anytime soon, though, and I'm not sure whether or not I'll go on to read the sequels.